Waffles with Brown Sugar Butter Syrup. 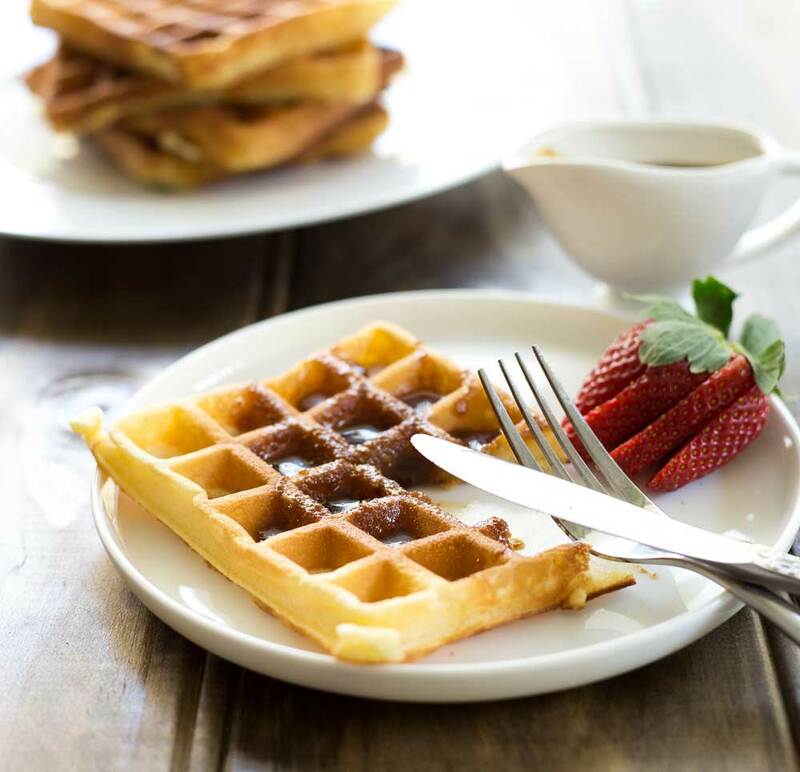 Soft, fluffy waffles drizzled generously in a rich brown sugar butter syrup. Perfect for a special brunch. These Waffles with a Brown Sugar Butter Sauce are our weekend treat. The waffles are crisp on the outside and fluffy on the inside. And the brown sugar butter sauce is good enough to eat with a spoon! I first published these Waffles with Brown Sugar Butter Sauce back in August 2015. But they are such a loved recipe that we eat them at least once a month! 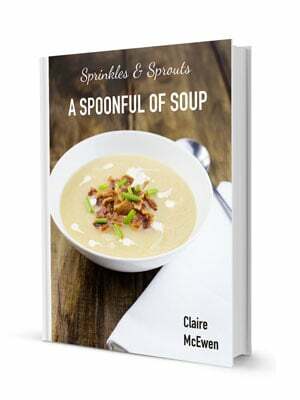 So I have boosted the recipe back to the top of my blog, so you can love it too. Then when everyone is fully awake, we can have a leisurely breakfast. This is usually something sweet as the boys have eggs most school day mornings. (I have got scrambled eggs on toast down to 4 minutes). Think pancakes, waffles and cinnamon buns. Today I promised the boys waffles, soft fluffy waffles. These waffles are soft inside and crispy on the outside. When you first cook them, you will think they are too soft, but as they rest they firm up leaving you with the perfect crispy and fluffy waffle. Then you can drizzle them with brown sugar butter syrup. Yes you heard correctly. Brown sugar butter syrup. This syrup tastes amazing. 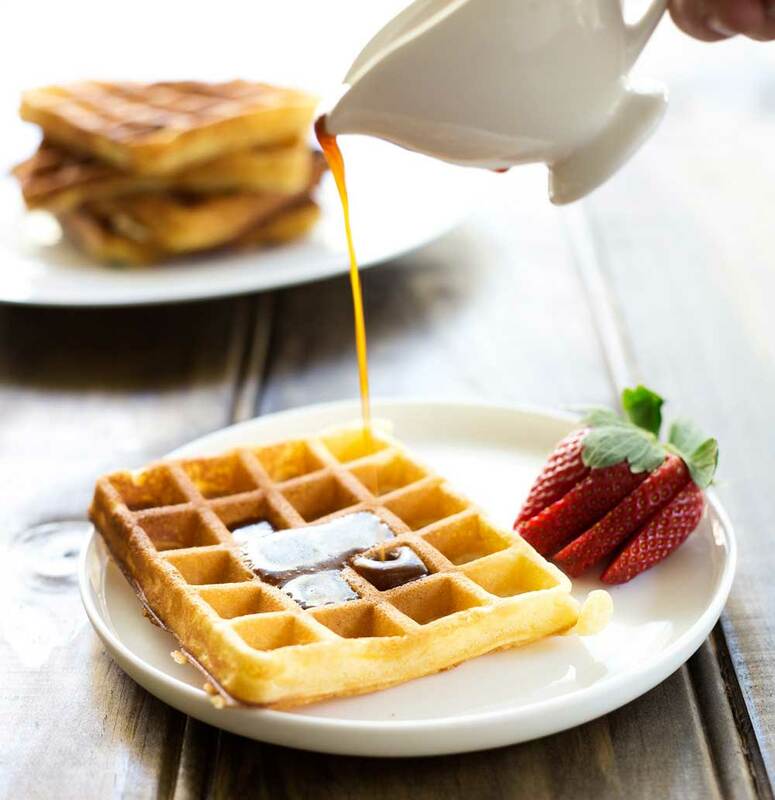 The name says it all, the rich molasses taste of brown sugar melded with the creamy buttery taste of butter 😉 It is the perfect match for waffles, but if you don’t have a waffle machine then you could use the brown sugar butter syrup on pancakes. 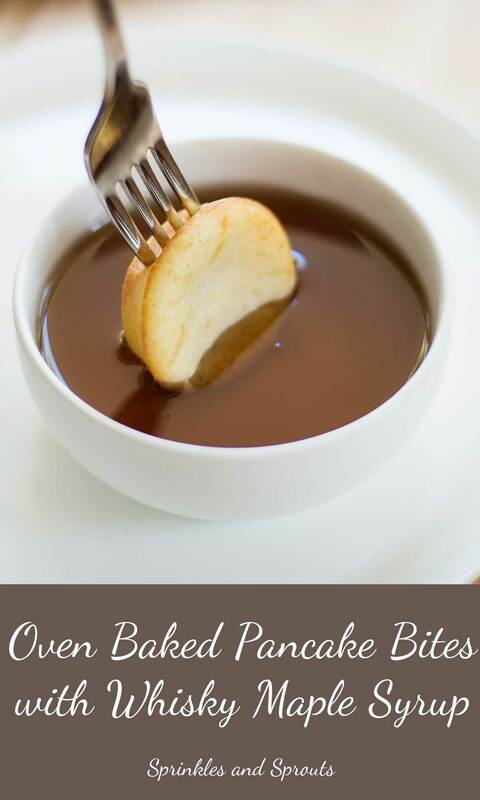 It is wonderful poured over my Pancake Bites. They look like cupcakes and taste like pancakes. And what is more they are cooked in the oven. Waffles with Brown Sugar Butter Syrup. 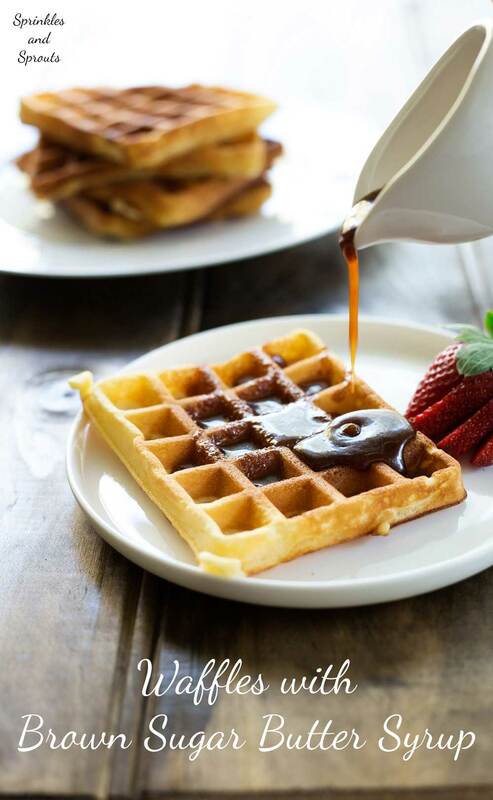 Soft, fluffy waffles drizzled generously in a rich brown sugar butter syrup. Perfect for a special/weekend breakfast. Place the brown sugar, milk, water and butter into a small pan. Place over a low heat and allow the butter and sugar to melt. Let the syrup bubble for 5 minutes until thick and gloss. Turn the heat off, but leave in the pan. Set aside. Put the butter in the microwave for 20-30 seconds until just melted. Measure the milk and water out into a jug, add the butter and eggs and whisk to combine..
Add the flour, sugar, baking powder and salt to the milk mixture then whisk until well mixed. Use a 1/2 cup measure to scoop your batter into each section of the waffle machine. Cook for 3 minutes until golden. Remove from the machine and place in the oven to keep warm whilst you finish the cooking. I have a Kenwood waffle machine. It doesn't have a variable temperature, just on or off. As all machines are different the cooking time will vary by brand. I would suggest starting with a medium heat and checking the pancakes after 2 minutes. 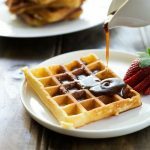 I always get waffles when I stay at cure bed & breakfast places, it seems so appropriate to have some, but OMG that homemade sauce sounds so good, I would pour it on everything! Waffles are the best aren’t they? I was so excited when I got my waffle maker!!! I love it. Stew bought mine on special in Good guys for $49 🙂 Best 50 bucks ever!!!!! Brown sugar butter syrup sounds earthy and creamy at the same time. And soft, chewy and exterior crisp on the waffles…mmmm!!! It is my favourite way to enjoy waffles, well certain when they are for breakfast. I love the cakier Belgium ones, but for breakfast I want soft, fluffy but with a bit of crisp. And butter just makes everything better! Waffle looks tempting. Love it. Thank you. They are ones of my kids favourites. Ooh these look so delicious. I make a very similar sauce, only I add chocolate to mine too. hadn’t thought to try it without. Beautiful clicks! I would love to have these waffles for breakfast!